I am a sucker for lots of things. Some of which include dogs, my own children, my husband, Lilacs, doughnuts, goat cheese and not to be left behind, hot spinach salad. At my first restaurant job I used to make salads (among other things) and it was the first time I had made a hot spinach salad myself. It was super traditional with the bacon and chopped up hard boiled eggs and maybe sunflower seeds? Not sure- was a veeeery long time ago, but the way I made the dressing has always stuck with me. I made it hot, in the pan! Then I tossed the spinach in the hot dressing and the spinach leaves got perfectly, slightly wilted (not steamed!!). The secret is in cooking the dressing in the bacon fat and bits and pieces in the pan and then removing the pan from the heat before you add the spinach. 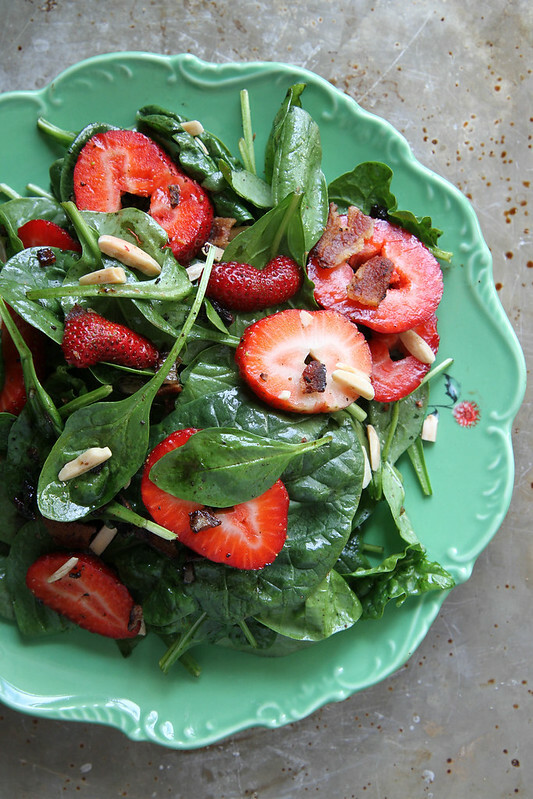 Plus I love the addition of the sweet and tart strawberries and the crunchy toasted almonds- this is a spring salad at it’s best! (I served this with Grilled Salmon for dinner and we scarfed it down) Plus, I also loved hot it looked served straight away in the cast iron skillet I used. If the skillet cools down pretty quickly, this is a nice but different way to bring it to the table! In a skillet or heavy pan, cook the bacon slices until crispy on both sides. Set the bacon aside. Drain the rendered bacon fat and then add the shallots and a sprinkle of kosher salt. Cook over low heat for about 5 minutes. Then add the sugar, oil and vinegar and stir together. Continue to cook over low heat for 5 minutes. Remove the dressing from the heat and add the spinach and gently toss. Then add the almonds and crumbled bacon. Season to taste with kosher salt and pepper. In a skillet or heavy pan, cook the bacon slices until crispy on both sides. Set the bacon aside. 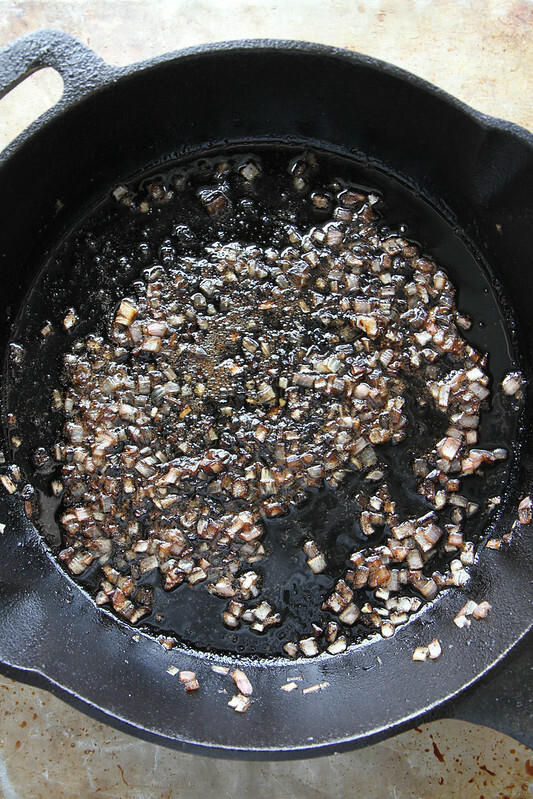 Drain the rendered bacon fat and then add the shallots and a sprinkle of kosher salt. Cook over low heat for about 5 minutes. Then add the sugar, oil and vinegar and stir together. Continue to cook over low heat for 5 minutes. 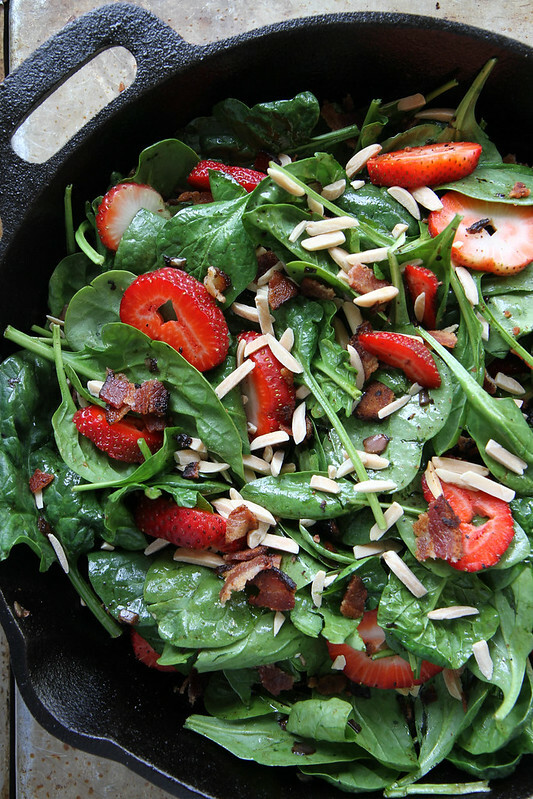 Remove the dressing from the heat and add the spinach, almonds and crumbled bacon. Season to taste with kosher salt and pepper. Gorgeous Heather! 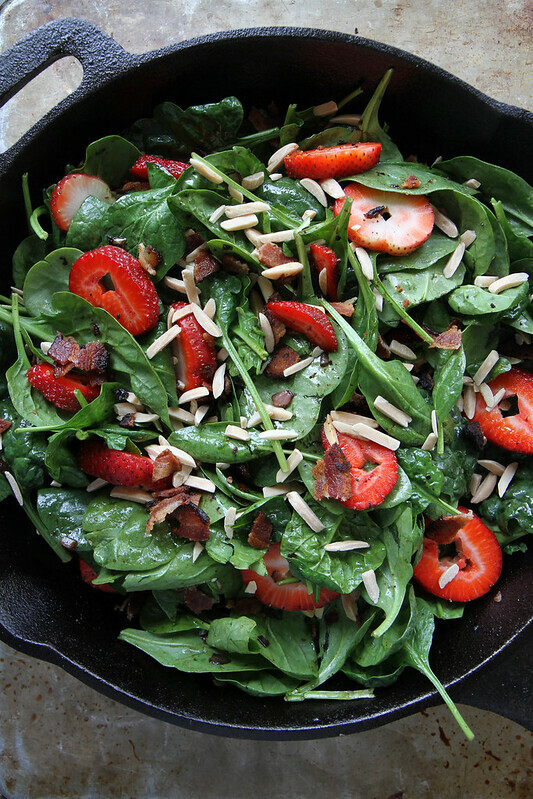 I love that this is hot and I especially love the strawberries and bacon! 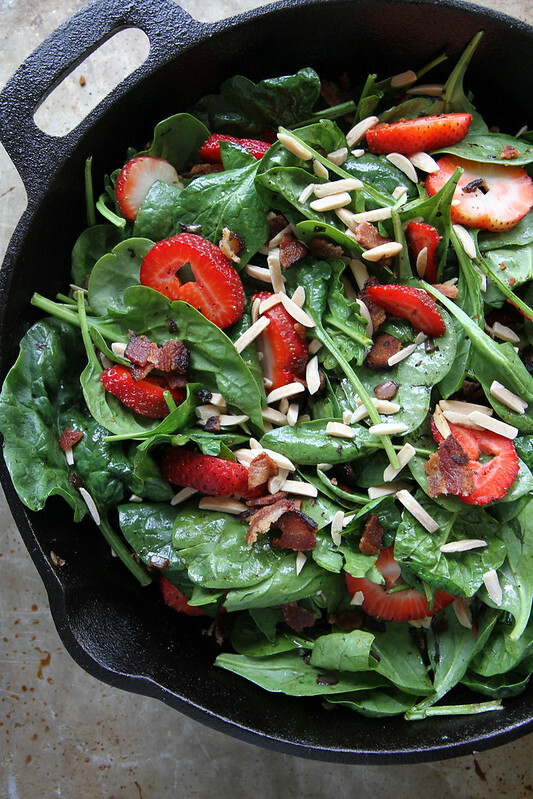 Strawberries and Bacon are actually maybe my favorite new combo Teighan!! Oh, yes! This is a blast from the past. I remember when this type of salad was all the rage in the early 90’s. Leave it up to you, Heather, to bring it back in style. Haha! It totally was Kelley! I know it carried into late nineties/early 00’s cause that when Iw as making it in the restaurants. Seriously, this is one of the worst things about being a vegetarian; the lack of bacon for a hot spinach salad and carbonara. Vicki- have you ever tried one of the smoked tofus? I feel they probably have lots of good soy based substitutes. Cooked in a liberal amount of olive oil, it could probably sub for the bacon pretty easily? 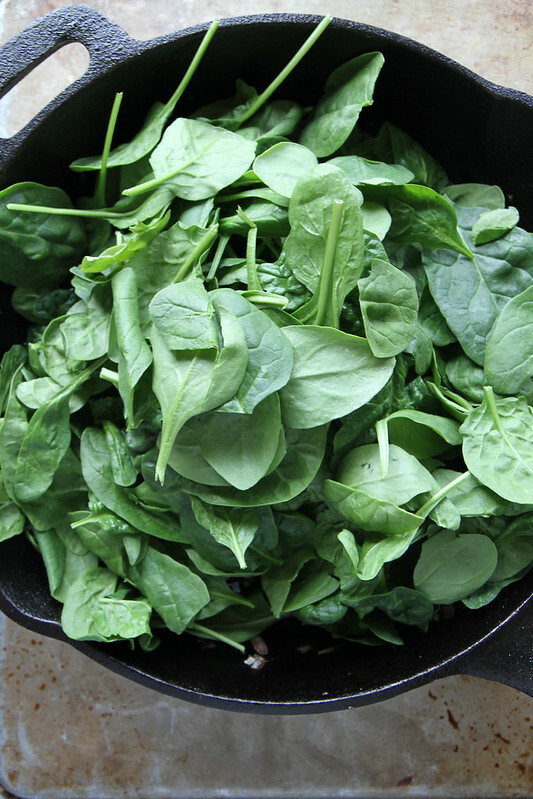 I make this with red wine vinegar and white sugar- never thought to toss spinach in the hot pan though! Will have to try it your way. One of my fave salads. Heather, this is without a doubt my kind of salad! Pinning! Gorgeous. This is my kind of salad. I’m a total sucker for this salad, too! Gorgeous, Heather! I tried this today using all the same ingredients but doubled the dressing and had it cold instead of cooked…..DELISH!!!!!!!!!! Nom nom nom The fam loved it too! Love it! Used turkey bacon, this was light & easy! Oh good Shida! glad you liked it! I love this twist on a classic — so perfect for Spring! Hey there Heather! I’ve been stalking your salad section, and at 6AM I have an undeniable hankering for a salad – they all look so delicious! I’m typically not a fan of these kinds of salads, but your story, along with your stunning photos make it look sooo good! I can’t wait to try all of your creations!